Posts from “Animal Crossing” for the GameCube! 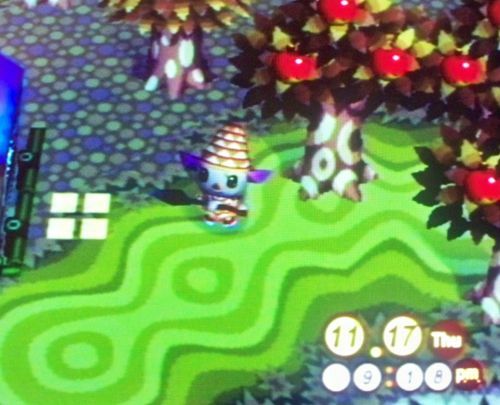 In my blog’s infancy, there was a brief time when I re-visited my first Animal Crossing town ever, Ordale. It was fun for me to re-visit this sacred town of childhood memories, but it was probably misguided for me to blog as much as I did, because no one else shares my nostalgia for this town! I mostly wanted to show off the events and holidays, which are very charming. « Previous in AC:GC Journal | Happy new year! Yes, this is my second AC:GC post in a row, but no, I haven’t forgotten about AC:WW or AC:CF. 😛 I’m actually pretty busy in AC:WW; I’m in the middle of dead spot testing in Dafdilly, so there will be a post about that when I’m done. As for AC:CF, I simply can’t spend a lot of time right now resetting for the town I want. – I have a new little addition to the top of my welcome widget, it’s a note about my WiFi status that I will update when I’m unable to WiFi, able to WiFi, and when my gates are open. 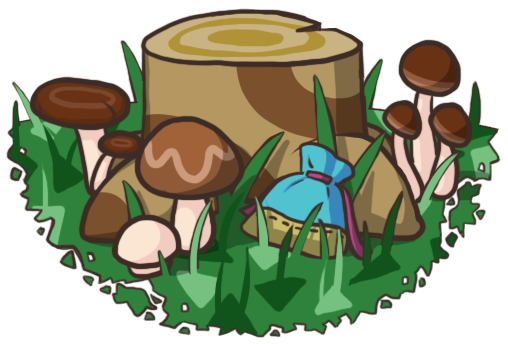 – January’s information page is up! – The pattern page. Sorry, things keep coming up to prevent this from getting my full attention, but my new goal is to have it up by the end of January. I found Tortimer on the way to the lake, but he’s on the other side, all by himself. Come on, join the party! He gave me this noisemaker, which makes an odd buzzing sound. I really like the fireworks in this game and how they’re reflected in the lake since you can’t see the sky. Wow, a super bright yellow one! Tortimer was at the Wishing Well to give his usual holiday memento — today a diary — and provide wisdom. That didn’t sound very good, so I tried again. There we go. This sunshine lottery isn’t very consistent, Katrina. xD I hope you all have a great year ahead of you as well! Yep, it was snowing heavily last night and it looked beautiful! I have several log cabin-style houses in Ordale and they look nice and cozy in the snow with the lights on. Both oaks and cedars can have holiday lights in AC:GC, so your whole town looks festive, not just the northern part. He asks three questions before finally giving a present, and what he gives depends on the answers you give. Big things=Jingle furniture, Foldable things=Jingle shirt, Woven things=Jingle carpet, Printed things=Jingle wall. I picked big things since the Jingle shirt wasn’t as important to me as completing the series. Yes, and I will continue to do until you give me a present. xP This time he asked if I prefer printed things or woven things, and I said woven (carpet). His final question was a face-off between Jingle furniture and the Jingle carpet since I said I preferred those over the others. I went with the carpet first because I think it’s the most important piece to establish the feel of the series; if I don’t get all the furniture, I can always mix and match red and green furniture from my catalog. Aw, looks like the jig is up. 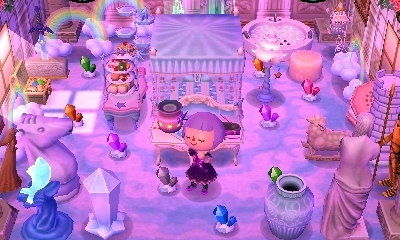 This past Thursday was the Harvest Festival in AC:GC and AC:CF, and since I haven’t found the right town for AC:CF yet, I made sure to take a little time to partake in the festivities in Ordale. My first golden tree ^_^ Planted with a shovel in my last post. It’s so pretty! I had an AC:WW town named Goldleaf once, but I think the name would be so appropriate for an AC:GC town with lots of these trees. As I got closer to the Wishing Well acre, this music began to play faintly and grew louder and louder until I was at the feast’s tables with the rest of my neighbors, who were laughing, drinking, and having a good time. Tortimer was also there and gave me one of his many special events gifts. My neighbors kept giving me hints about which row or column of acres Franklin was in as if they wanted me to do the dirty work, unaware that I was secretly helping him out. And again. 😆 Maybe refraining from poking your head out every two seconds would make your hiding places more secure, Franklin. He was thankful everytime I brought him the silverware and gave me a piece of the Harvest series in return each time. 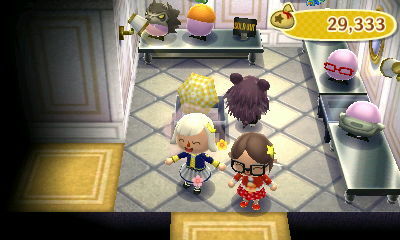 The next day was Sale Day, which I expected to be like the sales in AC:WW, so I was surprised to see all these red bags! When I opened the grab bag, I was surprised to see three items pop out in my inventory! Last Saturday I decided to check up on Ordale again for the first time since Halloween, still in rags :P, and the first thing I saw when I stepped outside (other than the junk and the ridiculousness that is my house) was snow falling! 😀 Though you can’t really see it good in this picture, there’s just a few flakes on my roof. I was somewhat reluctant to change my roof color and remove the rainbow pattern on the sign and door because they’re reflections of my tastes when I originally played this game many years ago. But if I’m going to continue playing in this town, I should have it reflect more of my current tastes, so I changed my roof color to classic red and removed the rainbow pattern from my house. Later on I’ll change the interior, too, based on what I have available in my catalog. Um, I think I’ll pass. xP In fact, I went in for the day after this, brrr. Wow, after playing AC:WW so long, it was strange to see Tortimer wandering around. He gave me a trophy, but I forgot to see what it looks like. >_< And I wonder how it compares to what you get if you win the tournament? The first thing I manage to catch is this old boot. -_- Fishing is a lot harder in this game than I remember. I swear I press the A button as soon as I see the ball go under water, but it’s almost never fast enough to catch any decent fish. 😦 I don’t know what happened, some of my fondest memories of this game are fishing for hours in the rain catching tons of red snappers, barred knifejaws, and coelacanths. After a few tries I caught my first real fish; it was just a sea bass, but I thought it might be good for the tournament, so I returned to the lake, where the judge’s tent is located. Meeting Chip, the judge of the Fishing Tourney. Aww, I thought it would be perfect, the biggest bass you can get! I took the small bass to Chip and he was only slightly more pleased with it than the sea bass. ishing has become too difficult for me in this game, so I gave up. Another shiny spot! This time I buried a shovel and a beautiful golden sapling sprouted up, but sadly it died. Wow, even if I had beat Eunice I probably would have just been beaten later by Pate. Meeting Murphy, the grumpy green bearcub. xD His house location is my favorite, in a little nook in the cliff. And yesterday I found Kabuki, who’d moved in the day before, making my town full! 😀 It should be interesting to see how long it will take for someone to move and who it will be, quite possibly one of the villagers who have lived in Ordale over six years. Happy Halloween everyone! Today I felt like checking up on Ordale again to see what festivities might be going on for Halloween. The outside of my house looks much the same as in my first and last post on Ordale (and the same as it did around 6 years ago, in fact :P), only the grass and trees have changed to Fall colors since then. I was hoping that Nook might be selling a few pieces of candy today, so that I could at least participate a bit in trick-or-treeting, but it looks like I missed out. Confused at the lack of trick-or-treeting going on, I went on a search for the town bulletin board. The post office seemed like the most logical place for it to be after playing AC:WW for so many years. But I got it done in the end. 🙂 I find it easier to de-weed in AC:GC because you can focus on one acre at a time. I have a few of these half-grown trees around town that have stunted in their growth, what’s up with that? 😕 I hope I can axe them down, or else they’ll be a real eyesore. Wow, after all the weeds were pulled, the wishing well had this to say, which I didn’t expect at all. 😮 Ordale couldn’t possibly be close to perfect if it was an AC:WW or AC:CF town, I assume that AC:GC’s standards must be lower (which makes sense, there’s no gold watering can reward). So I guess junk on the ground doesn’t matter? I wanted to pick everything up anyway, but Nook wouldn’t let me sell anything today because of the monthly raffle. Still no information about what time the festivities start, but I was just relieved that there were definitely going to be some. 😛 After seeing the notice about buying candy, though, I was sure that I wouldn’t be getting any of the spooky series. Trick-or-treeting began at 6 PM and this music began to play. The first costumed neighbor I ran into was Freckles, who demanded candy as soon as she saw me walk by. My concierge costume turned to rags. 😦 I met many other neighbors and they conducted themselves in a similar fashion, but I didn’t waste any more fruit on them, haha. Finally I found the real Jack, distinguishable as being the only pumpkin-head who doesn’t run up to you when seen. I hoped my conversation with Jack might go differently from my neighbors’, but it was pretty much the same thing. I’ve been wanting to check up on my very first Animal Crossing: GameCube town from my childhood, called Ordale, for a while now. I finally did this morning and decided to share these pictures of my first town. 🙂 I’ll post them in the order they were taken rather than arranging them in an order that makes sense. That way you can get a feel for how lost I was wandering around my old town.